After calming Holgate, Madley consulted his fourth official, Jon Moss, who then passed the information along to Klopp, though the Liverpool manager said he did not “understand” the nature of what he was being told until Moss reiterated it after the game. His counterpart, Everton Manager Sam Allardyce, would not be drawn into commenting on his understanding of what happened, stating after the match that his responsibility extended only to soccer, rather than to “controversial incidents,” and that he preferred to let “whatever systems are used” establish the truth of what happened. 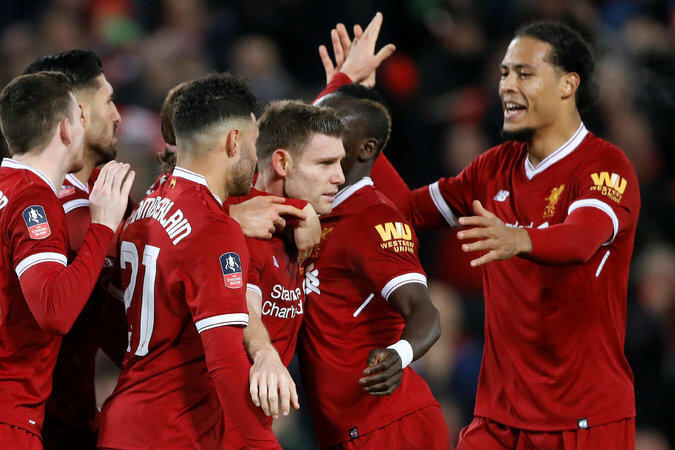 Virgil van Dijk, right, celebrating James Milner’s first-half penalty kick. Van Dijk, whose recent acquisition from Southampton turned him into the world’s most expensive defender, made his Liverpool debut in Friday’s F.A. Cup match against Everton.